I kept seeing friends rave about My Lady Jane on Goodreads so I procured an audio copy from the library to see what all the fuss was about. I am SO glad I sought this book out. Has there ever been such a charming young adult novel? I’m trying to think of one and coming up blank. Maybe Fangirl by Rainbow Rowell, but the types of charm are completely different in tone. My Lady Jane was co-written by three authors and the story is extremely tongue in cheek. The narrator of the book is self-aware and very funny. It’s hard to say if I’d have liked the reading experience of a physical book as much as the audio because the narrator was delightful and added something wonderful to the story. 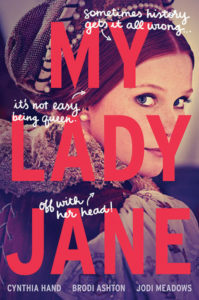 The story is a retelling (or if you’d prefer, the secret untold real events) of Lady Jane Grey. You might remember from your history classes that Lady Jane Grey was once Queen of England for a short time and then executed by Mary I (aka Bloody Mary). Or WAS she executed? My Lady Jane tells the “real” story of how England was at war with itself over humans called eðians that can shapeshift into animals. Sickly King Edward is slowly dying and decides to arrange a marriage for Jane with an eðian who turns into a horse every day. Then he leaves the kingdom to her which really pisses Mary and Jane off who had other plans. I can’t really do this book justice in a book review. It was so refreshing to read something like this in young adult fiction. If you’re looking for something lighthearted and slightly off kilter, this book would do nicely. Share the post "It’s not easy being queen"